Mops are essential for keeping your home clean and dirt-free. But what kind of mop would best suit your home? With so many different kinds on the market, it can be hard to decide what will be useful and most suitable for your house. At Comparaboo, we are constantly scanning and reviewing thousands of products to make your online shopping more convenient. This guide was designed with your cleaning needs in mind we hope it will help you decide which mop will best suit your home! Flat: Flat mops consist of rectangular heads that sit on floor surfaces. These kinds of mops make use of either disposable or reusable sheets that makes for convenient cleaning. There are different types of flat mops designated for different types of cleaning: sponge mops, dust mops, and microfiber mops. Sponge mops are exactly how they sound- they are equipped with a giant, absorbent sponge. This type can be used to clean up spills or used with a cleaner to disinfect and clean your floors. These are great for floors that are texturized or grooved because the sponge can get in the cracks. However, these mop heads also need to be replaced often due to disintegration and their nature to hold onto dampness and dirt. 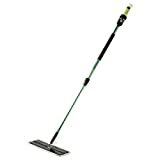 Microfiber mops are made of materials that are very absorbent and can hold onto dirt and dust. 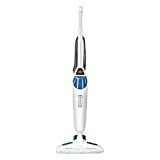 They are extremely convenient for cleaning any mess and are very durable because of its synthetic material. 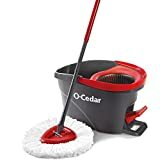 These mops can be used on any surface, so if you have wooded parquet floors that you do not want to scrub, microfiber mops would be perfect for you. String: This is the most traditional type of mop where its head is made of long, looped strands of cotton. 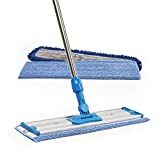 This type of mop is great for hard surfaces, such as cement or laminate, but the head needs to be changed frequently due to the cotton strands’ high absorbency. 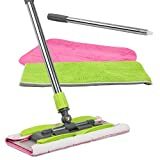 Rag mops: Rag mops have a lot in common in their design with string mops, except that the looped strands of cotton are replaced with cloth material. Like string mops, these are highly absorbent and can move in tight spaces well. 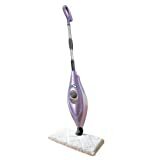 Steam mops: These are battery or charger operated, and use water in the built-in system to clean. Steam mops have a small compartment that is filled with water, and when plugged in, converts that water into steam. The steam works to enable the mop to act as an all-in-one disinfectant, cleaner, sanitizer, and vacuum. Spray mops: While similar in physical appearance to steam mops, spray mops require the use of detergent as its cleaning agent. Spray mops clean by spraying water and detergent onto the floor’s surface before the flat rectangular head goes over to clean the area. 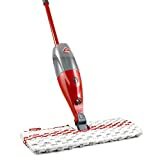 Holding power: Since you are cleaning your house and trying to get rid of messes and allergens, it is important that the particles don’t come off once your mop has picked them up. This can be achieved by buying quality-made pads and materials. Handle: Some mops have gripped handles to make cleaning more comfortable and efficient. The happiest customers are those who got themselves a mop with a sturdy handle. Batteries: While some steam and spray mops require batteries, others do not! Many people prefer mops that are battery and electricity free, but this is entirely dependent on personal preference. Detergent: The best rated mops gave users the option of using their own detergent instead of pre-moistened pads. 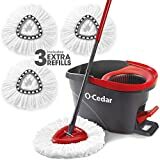 Mop extenders: Different mops will have different heights and handle sizes. Before buying a mop, make sure to check that the mop’s height and handle size is suitable for those in the family who will be cleaning the most often. 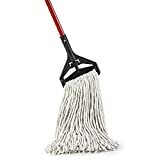 Most mops nowadays have extendable handles, but if you have a particular mop you want that is too short, consider getting a mop extender so that you can clean comfortably. 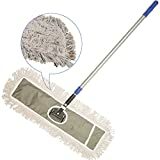 Mop size: An adequate mop head size is essential for any cleaning, especially if you have a lot of surface area that needs to be covered! 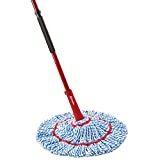 Most mops are around 6-8 inches long or in diameter, however, some rag mops may come in larger sizes. 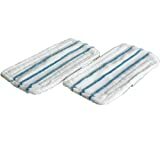 For larger areas, mops with disposable pads will not be very efficient, so you should look for a mop that has reusable pads. Rubbermaid: For over 80 years, Rubbermaid has been creating durable, high-quality products, and has been recognized as a “Brand of the Century”. O-Cedar: Founded in the early 1900s, The Channell Chemical Company was renamed O-Cedar to reflect the ingredients it used to manufacture waxes and wood polishes. This innovative company has had many firsts, including the first spray mop to offer disposable and machine washable microfiber pads. Bona: Founded by Wilhelm Edner in the year 1919, Bona is a Swedish company that is trusted worldwide by many cleaning professionals. It even became the hardwood floor care sponsor for the NBA.